This is an inky brooding wine, the perfect accompaniment to a rich stew or a Sheppard’s Pie. 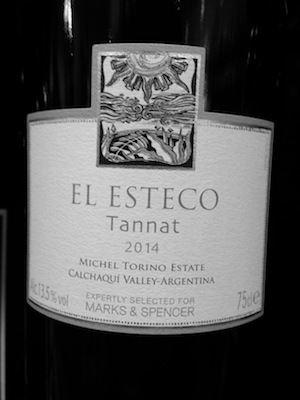 As much as I like Tannat, you don’t often see much of it around as it’s among the more obscure grape varieties to have originated in Bordeaux, but it is making something of comeback. Not only have the big French strongholds of the grape (Madiran, Saint Mont) in the south west of the country, been upping their game considerably, but the major South American wine regions have been getting excited about it too. Which leads us to this Argentinian bottle from M&S. In the glass this has a deep inky black colour with dark purple rum, earthy mineral-tinged black fruits (black cherry, blueberry), powdery vanilla and a hint of violets and barrel toast peeking through. On the palate there’s black cherry and earthy blackcurrant fruit, garrigue herbs and a wealth of spices (liquorish, clove, nutmeg) underpinning an inky mineral depth. The tannins here are surprisingly soft and supple for this grape variety and will soften more with a little bottle age. This is a rustic wine with plenty of depth and weight to stand up to any hearty fair you might choose to serve with it, while still being approachable enough (just), to enjoy by itself. £7.50 (full price) from M&S.